Thermal radiation from the sun is largely lost on most silicon solar cells. Up-converters transform the infrared radiation into usable light, however. Researchers have now for the first time successfully adapted this effect for use in generating power. There is more to solar radiation than meets the eye: sun- burn develops from unseen UV radiation, while we sense infrared radiation as heat on our skin, though invisible to us. Solar cells also ‘see’ only a portion of solar radiation: ap- proximately 20 percent of the energy contained in the solar spectrum is unavailable to cells made of silicon – they are unable to utilize a part of the infrared radiation, the short-wavelength IR radiation, for generating power. Researchers of the Fraunhofer Institute for Solar Energy Systems ISE in Freiburg, together with their colleagues at the University of Bern, Switzerland, and the Heriot-Watt University in Edinburgh, Scotland, have now for the first time made a portion of this radiation usable with the assistance of a practical up-converter. The technology that transforms infra- red into usable light has been known about since the 1960s. However, it has only been investigated in connection with solar cells since 1996. “We have been able to adapt both the solar cells and the up-converter so as to obtain the biggest improvement in efficiency so far,” reports Stefan Fischer happily, a scientist at ISE. The potential is big: silicon solar cells theoretically convert about thirty percent of sunlight falling upon them into electrical power. Up-converters could increase this portion to a level of forty percent. However, how does the up-converter manage to utilize the infrared radiation for the solar cells? As solar radiation falls on the solar cells, they absorb the visible and near-infrared light. The infrared portion is not absorbed, however, it goes right through them. On the back- side, the radiation runs into the up-converter – essentially a microcrystalline powder made of sodium yttrium fluoride embedded in a polymer. Part of the yttrium has been replaced by the scientists with the element erbium, which is active in the optical range and responsible in the end for the up-conversion. As the light falls on this up-converter, it excites the erbium ions. That means they are raised to a higher energy state. You can imagine this reaction like climbing up a ladder: an electron in the ion uses the energy of the light particle to climb up the first step of the ladder. A sec- ond light particle enables the electron to climb to the second step, and so on. An ion that has been excited in this manner can “jump down” from the highest step or state. In doing so, it emits light with an energy equal to all of the light particles that have helped the elec- tron to climb on up. The up-converter collects, so to speak, the energy of several of these particles and transfers it to a single one. This has so much energy then that the solar cells “see” it and can utilize it. Researchers had to adapt the solar cells in order to be able to employ an up-converter such as this. Normally, metal is vapour-deposited on the backside, enabling current to flow out of the solar cells – so no light can shine through normally. “We equipped the solar cells with metal lattices on the front and rear sides so that IR light can pass through the solar cells. 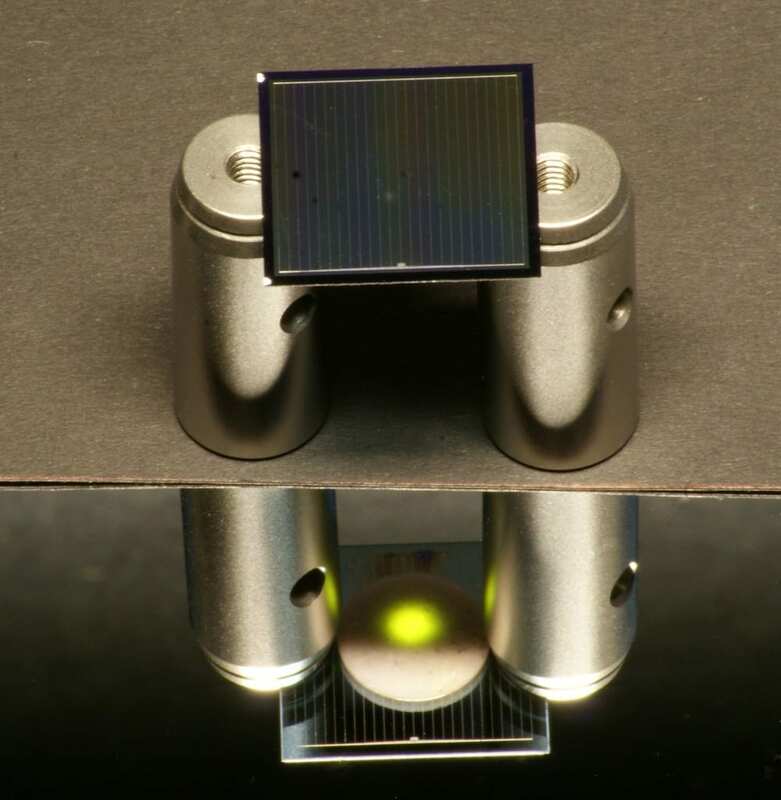 In addition, the light can be used by both faces of the cell – we call this a bi-facial solar cell,” explains Fischer. Scientists have applied specialized anti-reflection coatings to the front and rear sides of the solar cell. These cancel reflections at the surfaces and assure that the cells absorb as much light as possible. “This is the first time we have adapted the anti- reflection coating to the backside of the solar cell as well. That could increase the efficiency of the modules and raise their energy yields. The first companies are already trying to accomplish this by implementing bi-facial solar cells,” says Fischer, emphasizing the potential of the approach. April 17, 2019 - Taking Care of Power Systems for Space Missions EE TimesElectrical power systems require the optimal combination of primary and secondary sources. November 12, 2018 - This Insane Device Both Harvests Solar Energy And Sends Excess Heat Into Space ScienceAlertWe're facing a deadly Catch 22. As the world grows hotter, people crank up the air con. As they crank the air con, the world grows hotter. And so on. And so on. November 19, 2018 - Increasing Solar Cell Efficiency with Thermal Analysis AZoCleantechRecently, there has been a large shift in the STEM community to increase efforts to develop sustainable technology. February 13, 2019 - Converting Heat Transfer Fluids into Solar Energy AZoCleantechThis article discusses how to convert heat transfer fluid into solar energy. December 31, 2018 - Why the Future of Solar Power Is from Space Singularity HubWith space-based solar power, we could solve our energy and greenhouse gas emission problems with little environmental impact. November 8, 2018 - A Sunny Forecast for Energy-Efficient Cooling | NOVA | PBS | NOVA NOVA NextScientists are pioneering technology that may someday cool buildings without electricity, while harvesting solar energy at the same time. February 21, 2019 - Swiss Company Boasts 29% Efficient Solar Panels Solar QuotesThe use of tiny "space-grade" solar cells and lenses have enabled Insolight to achieve a claimed 29% efficiency for its high-tech solar panels. November 16, 2018 - Harnessing body heat to power electronic devices Phys.OrgIf thermoelectric materials can convert low-grade heat into electricity, we may never need to charge wearable technology at home again. August 6, 2018 - Parker Space Probe: The Engineering Required to "Touch the Sun" Popular MechanicsFlying closer to the sun than ever before requires some of the most advanced manufacturing that humanity has ever achieved. January 22, 2019 - Do Solar Panels Degrade Over Time? Yes, But Not By Much Solar QuotesLearn about solar panel degradation rates, why they degrade and by how much. Discover brands that degrade the least and what to look for on the data sheet. February 18, 2019 - Alkali metals improve efficiency of perovskite solar cells Laser Focus WorldPerovskite-based solar cells could someday bring down the cost of solar energy, especially with the help of alkali metals. February 1, 2019 - How To Power Through A Heatwave – In Comfort – On 100% Solar Energy Solar QuotesEven on the hottest day ever recorded in Adelaide, my family of 5 powered through in air conditioned comfort using only solar energy. Here's how we did it. January 30, 2019 - An air conditioner powered by outer space and help from the sun GreenBizStanford researchers are testing a way to cool buildings without fossil fuels, while generating electricity at the same time. December 14, 2018 - Solar-powered clean water The Naked ScientistsA solar-powered device gathers energy from the Sun to evaporate water to produce superheated steam for cooking, cleaning and condensing to *fresh* water. November 28, 2018 - A new way to provide cooling without power MIT NewsA system developed at MIT can provide passive cooling without the need for power, and could be used to preserve food or vaccines in hot, off-grid locations. March 13, 2019 - Kits Monitor Solar Panels In Photovoltaic Plants Sensors OnlineLibelium and SmartDataSystem offer solar panel monitoring IoT kits that control performance parameters in photovoltaic plants. February 8, 2019 - How New 2D Materials Convert Wi-Fi Signals to Electricity Singularity HubThe device can capture around 40 microwatts of power from a typical Wi-Fi signal; not enough to power an iPhone, but plenty for a remote wireless sensor. January 10, 2019 - Perovskite improves solar-cell efficiency EDN.comSolar cells have been increasing in efficiency since their invention. Perovskite looks to provide the next increase at a reasonable cost. February 26, 2018 - Testing Solar Panels with Thermal Imaging Cameras Novus Light Technologies TodayLearn some of the nuances of using thermal imaging cameras to scan installed solar panels during normal operation. September 21, 2015 - Engineers invent transparent coating that cools solar cells to boost efficiency Phys.OrgEvery time you stroll outside you emit energy into the universe: Heat from the top of your head radiates into space as infrared light. August 30, 2018 - CSP: a long-term solar technology Deccan HeraldAn investor should consider the long-term benefits of CSP systems in addition to the short-term implications, such as large capital investment. October 12, 2018 - Duke Energy Plans New Microgrid and $500M Energy Storage Investment Microgrid KnowledgeDuke Energy plans to build a microgrid in North Carolina as part of the utility's plan to invest $500 million in energy storage projects over 15 years. February 7, 2019 - Australian Gold Mine Solar + Storage Project To Commence In May Solar QuotesGold Fields' Granny Smith gold mine east of Laverton in Western Australia will soon boast what's claimed to be one of the world's largest hybrid microgrids. September 3, 2018 - Solar Irradiance Monitoring in Solar Energy Projects AZoMKipp & Zonen offers a broad array of solar irradiance monitoring products. July 31, 2018 - Solid-State Silicon Device Turns Waste Heat into Electricity Machine DesignNew device could power satellites and other hard-to-*service* electrical devices. August 10, 2018 - 17.3% is organic solar cell efficiency record Electronics WeeklyChinese researchers are claiming an organic solar cell record - 17.3% efficiency under standard sunlight conditions from a solution-processes structure - a.
February 8, 2018 - We Can Now Harvest Electricity From Earth's Heat Using Quantum Tunnelling ScienceAlertResearchers have come up with a way we could harvest energy from Earth by turning excess infrared radiation and waste heat into electricity we can use. September 5, 2018 - Extracting Work From Diluted Solar Radiation Science TrendsIn the early stages of thermodynamics, researchers focused on the study of heat and work transfer. Thermal radiation, which is to be considered in various. September 6, 2017 - Keeping buildings cool by sending heat into outer space physicsworld.comWith about 15% of the world's electricity used for cooling, making air-conditioning systems more efficient could go a long way to ease future energy demand. August 1, 2018 - How an 8-Foot Frisbee Is the Ultimate 'Sunscreen' for NASA's Sun Probe Space.comNASA is preparing for its next big mission: getting up close and personal with the sun. And to do so, the agency needs a killer heat shield. September 14, 2016 - How to Cool a Solar Cell Interesting EngineeringKeeping solar cells cool increases their efficiency but is a challenge to achieve. One researcher reports on his success with silicon layers. February 5, 2019 - In a shift, front-facing solar panels win DC historic preservation approval Greater Greater WashingtonIf a homeowner wants to put solar panels on a roof facing a street, is that a laudable step toward fighting climate change or an affront to historic preservation?